Believe it or not, this is my 100th post. Thank you for reading. Thank you for helping. I ask questions from you all on a regular basis and you are a fountain of knowledge and wisdom. I was originally planning to install two new 4 x 4 beds, however… for just a little more money I could install 4 x 8 beds… and it would look more consistent with the rest of the garden. So, three of my boys helped me last night and we got one assembled. We went with weed fabric this time since I have had such an issue with the grass in the beds where we did the newspaper and cardboard. I’m under no delusions that this will stop the impenetrable forces of bermuda, but it’s worth a shot. I went for the premium, double thick stuff. It’s a slim hope, but still hope. Okay, so am I crazy, or is this an apple forming? 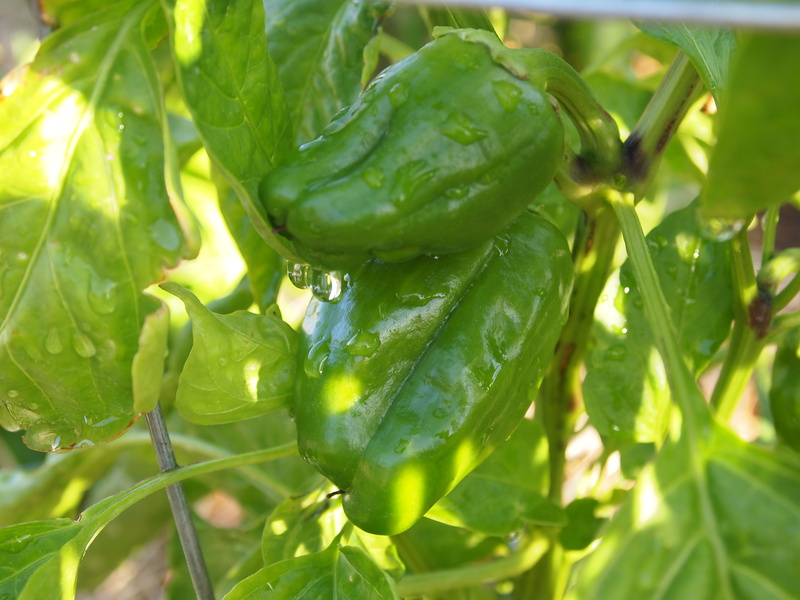 Bell peppers were planted in abundance, and had a good germination rate. I couldn’t bring myself to get rid of any of them, so… we’re going to have a lot of bell peppers, which is good because we eat a lot of them. 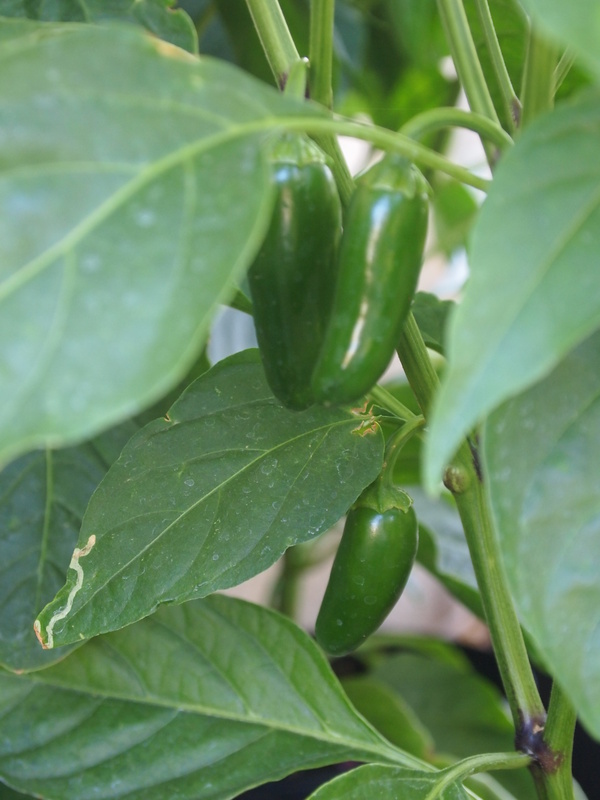 Jalepenos are coming along nicely. My wife has been making a lot more salsa lately so I’m interested to see how the home grown jalapenos change up the taste. The home grown cilantro made a WORLD of difference. I’m having mixed results with the desert kings this year. I decided to grow less of them in favor of more variety and I have several but they are more spread out in a couple of different spots. Still, I love these things. 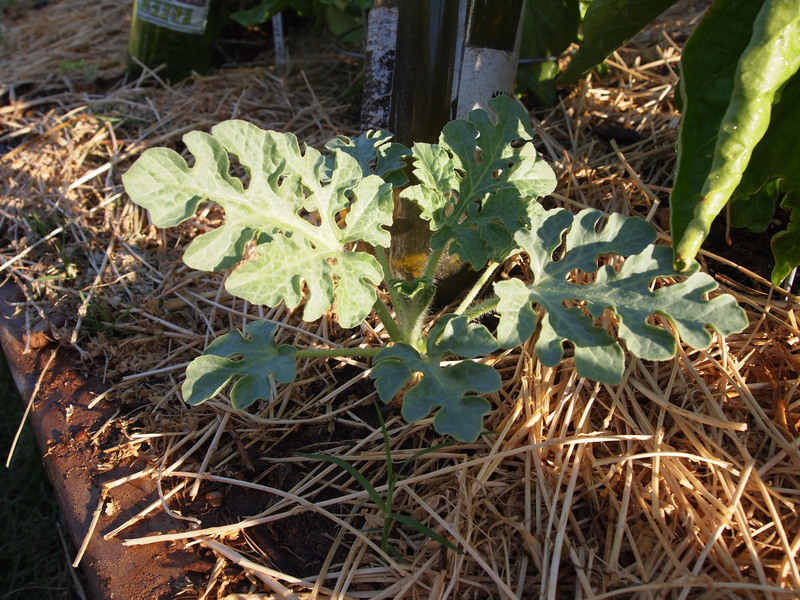 Such a great plant and a great melon. I missed the pablanos in my earlier post this week, so I got some yesterday. This particular plant is doing well with three. 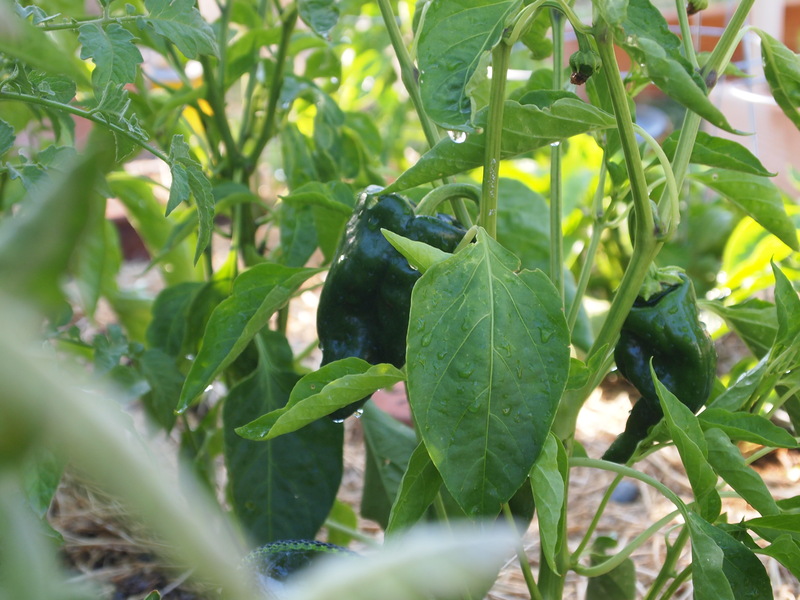 I’ve seen at least three other peppers growing on different ones in the beds and in the pots. I call them chili rellenos in waiting. 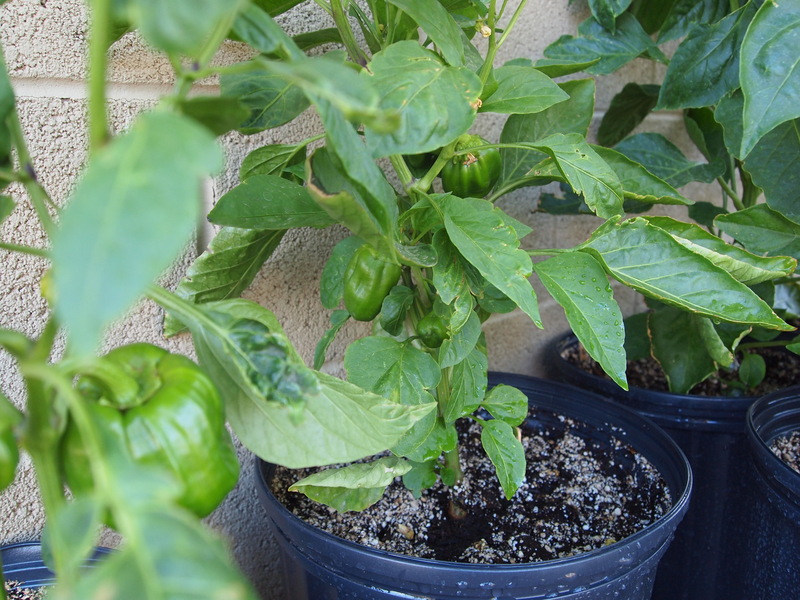 The pepper plants are perking up a bit after the sprinkle of my organic fertilizer mix. I’ll probably do it again in a couple of weeks. I wish I would have built the soil in the beds better. The beds I’m putting in now will have a very good mix. Lesson learned. It’s nice to see peppers and tomatoes living in harmony. 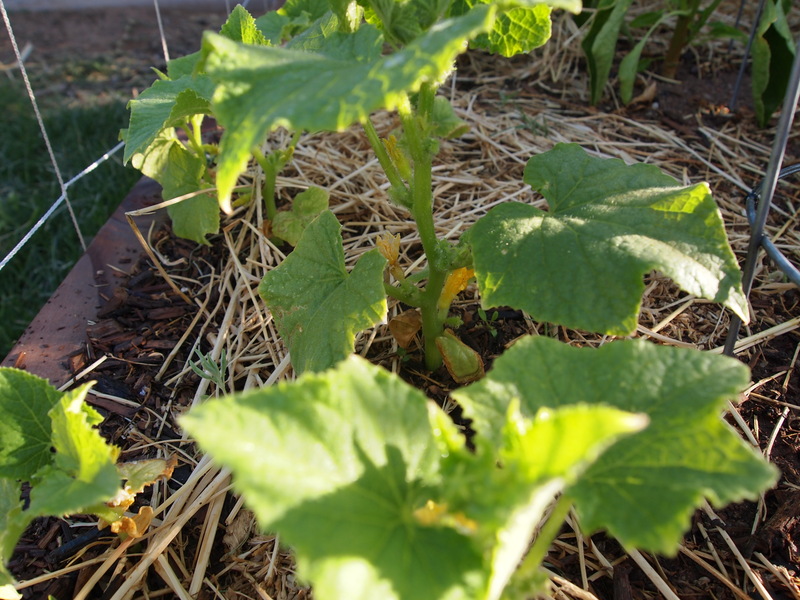 Finally, the cucumbers have decided that they DO want to grow this year. I’m very pleased about that. Pickles here I come! A couple are even getting some blossoms. I’d love to see these climbing up the trellis. I hope you all have a very blessed weekend! I hope you are blessed with plenty of sunshine and some great garden moments. 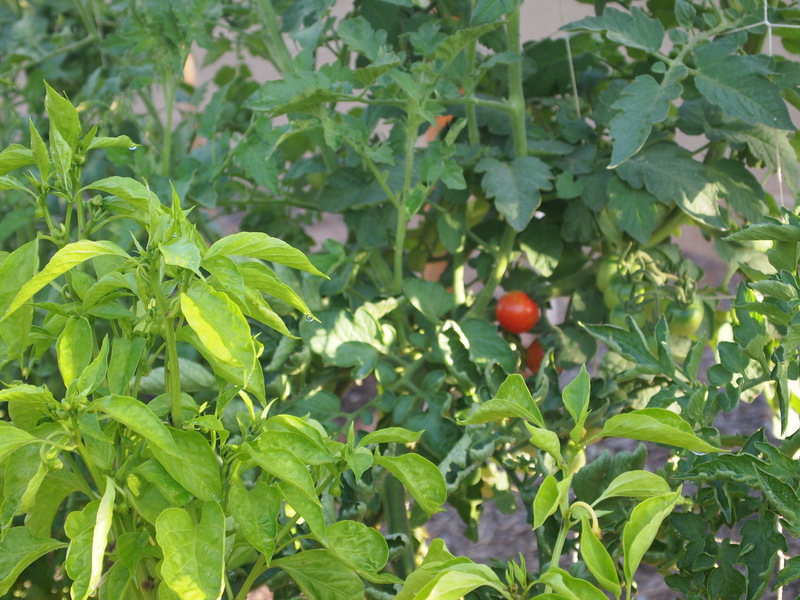 This entry was posted in Arizona Garden, cucumbers, Desert King Watermelon, grass, intensive gardening, tomatoes, trellis. Bookmark the permalink. 11 Responses to Thank you! Your garden is really starting to take off. Everything is starting to look nice and green and healthy. Looking forward to seeing how you cucumber’s do this year. I planted Cucumbers, radishes, cantaloupe, onions, and okra so far on the garden. Went out and checked on it last night and we have Radishes popping up. I have never canned cucumber’s but cannot wait to try. I tried making pickles last year. Made some critical mistakes and they ended up inedible. 😦 I haven’t grown okra. If I grew it I would feel compelled to eat it. Funnily enough, I asked the same question last year: yes, I believe that is an apple forming! 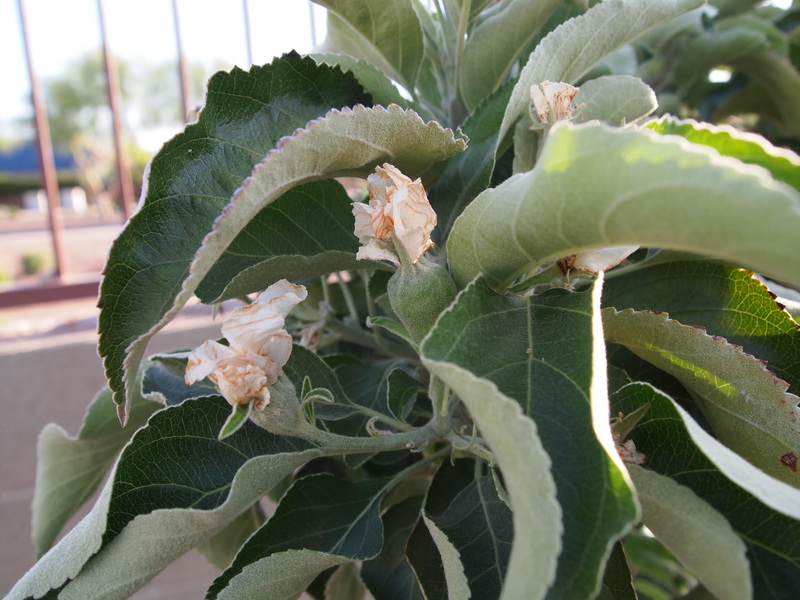 My tree is in blossom but not apples forming yet. They are very exciting to watch! Keith, your garden looks amazing. Mine is limping along just waiting for the weather to warm up. Old Man Winter is trying to hang on as long as he can this year. Last night was 45 for the low and the two nights before were 36 for the lows. The danger of frost is over but heat loving plants like tomatoes just sit there and shiver until it warms up. They just really haven’t grown much at all the last couple weeks because of the lower than normal temperatures. Sooner or later things will flip and the cooler weather will turn hot and life will be good in the garden for the hot weather plants. In the mean time, the garden sits, waits, and shivers. I like shivering, but I agree the plants don’t. Summer has definitely arrived in AZ. I’m just hoping it isn’t too much of a scorcher. You’re welcome to bottle up some of our heat and drag it to Nebraska. We could sure use some of your rain. Great looking peppers. 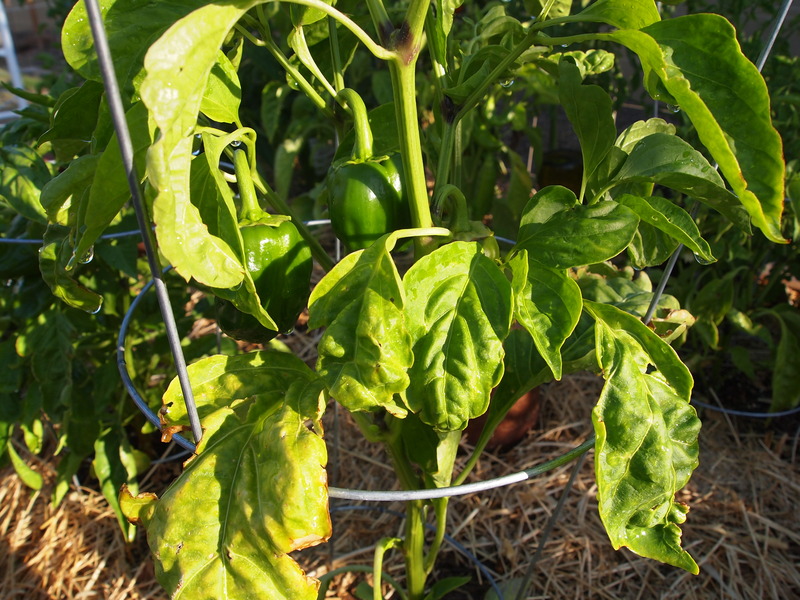 We’ve just planted ours so we’re a ways away from having any peppers on the plant. You probably know this but it is really easy to freeze bell peppers to use later. We just cut them into strips, put them in a freezer bag and freeze them. Then whenever you need peppers, just take the amount you need from the bag. I scramble them into eggs like that. They thaw out very quickly. I’m looking forward to my first fresh pepper of the year. We’ve never frozen peppers before but with the glut that we hopefully have coming we may just try that! I use weed barrier and have had hardly a weed in several years. I hope it works for you. So i see that you grow pole beans, do you prefer them over bush beans? Well that’s good news! So far so good in those beds. This is actually the first year I’ve grown pole beans. I have three varieties of bush and two varieties of pole planted. Kinda trying to figure out what will work best for us in the future. oh smart!! I am too lazy to stake them so that’s how my decision was made!